Struggling Super Aguri have been cleared to race in this weekend's Spanish Grand Prix despite continuing uncertainty about their future. Honda - which supplies Super Aguri with cars, engines and much of their funding - gave the go-ahead following meetings in Japan on Friday. The team still need a buyer if they are to continue beyond this weekend's race. The current crisis was caused when a potential investor pulled out of a takeover last week. 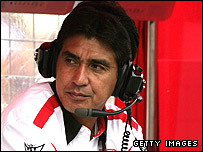 The cash-strapped team were set up by Honda in 2006 to secure the F1 involvement of protégé Takuma Sato. But customer teams will not be allowed in F1 from 2010 and Honda have told Super Aguri they are no longer prepared to bankroll the team. The Japanese giant now wants to be paid for what it supplies. Britain's Magma Group had been expected to complete a buy-out of Aguri's team at the end of March, with the financial backing of Dubai International Capital (DIC). But DIC, which is interested in buying Liverpool Football Club, is believed to have had second thoughts. The team are said to be in talks with a number of potential investors. Super Aguri's future has been in doubt for much of the winter, and Sato and his English team-mate Anthony Davidson were only able to compete in the opening three races after the team secured last-minute backing through Magma, an automotive industry consultancy and innovation group. Do you think Super Aguri will survive? Sato and Davidson were slowest of all in Friday's first practice session. "It's been a really difficult time, from the end of last year through to the start of this year," Davidson said. "I'm kind of learning to cope with that because it is difficult, really difficult, it's a battle, a fight. "You can tell yourself you are ready, but without testing here and with limited parts at the start of the year and all that stuff, it really does take a lot out of you. "There are a lot of drivers up and down the grid, with much more experience than myself, who would have crumbled by this point."